Phew. Is that what you are saying today? Let me tell you that I slept in! Only to come down to boxes needed to be recycled, new LEGOS strewn all over the kitchen table, presents in piles that need to be put away, and a Christmas tree with no more gifts underneath. It has been a long, super fun, week here at our house with family, but I am ready to move on. I felt like a kid again as I was opening presents this weekend. I was spoiled. I unwrapped an Instant Pot. Tell me wise ones – what should I make in it! AND I opened a trip to Las Vegas with my hubby to see Celine Dion. Can I tell you how excited I am? I have never been there and have begged to see her in concert for years! Where should we stay? and celebrate with a little sweet giveaway. 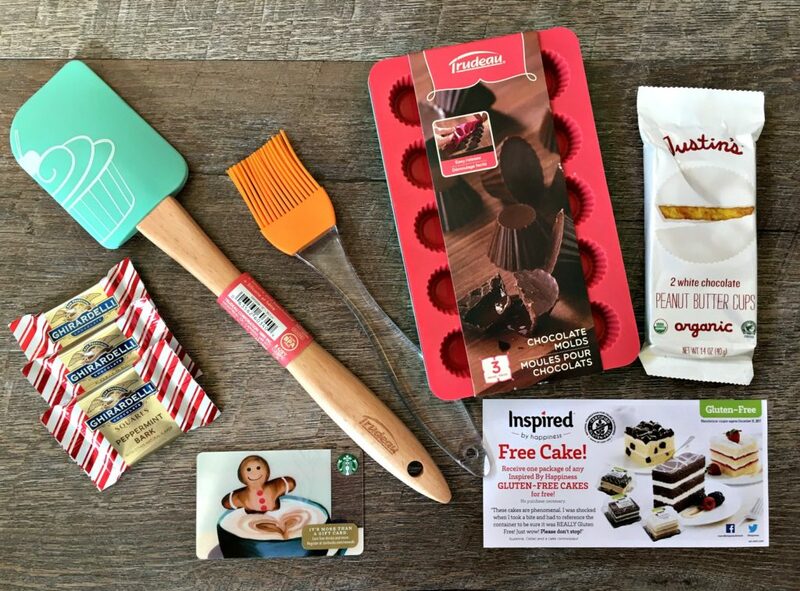 WIN $10 Starbucks and everything else sweet you see here! Let’s add a 2nd winner – $5 Starbucks! This giveaway is my own. Links may be affiliate. It will end on January 9, 2017 at midnight MST. Winners will be drawn via rafflecopter. Once a winner is drawn I will contact them and they will have 48 hours to reply before I draw a new winner. Giveaway is open to anyone in the US/Can for first prize. Second winner can be WW and you must be 18 years of age or older. Giveaway is not affiliated with Facebook & I release them of liability. Winner will be posted in the rafflecopter widget. I got exactly what I wanted! I got to be with my two one year old grandbabies! I got what I wanted and then some.. I am excited to use my new Keurig and my Instax Camera. We did get a nice surprise gift from friends. We are visiting friends out of town . It was a low key holiday this year, but I spent it with my loved ones so I have no complaints. My husband and I leased a much needed vehicle this year. In fact his vehicle almost broke down on the side of the road on the way home from the dealership. Yes, I had a fun time with the kids and grandkids! Watching them open their gifts is priceless. Our kids got us some great items from travel, and cash, which we needed. Had a nice Christmas...with family! I received some gifts that were unexpected. I was surprised and very happy! And I have no plans for New Years. I'll probably stay in and watch movies on tv. I'll probably stay in and watch movies on tv on New Years. My kids slept in on Christmas which was an amazing gift for me! I got everything I wanted for Christmas. I had a very happy holiday time with lots of family, friends and love. I do need a Starbucks boost tomy account and you have one right here! We did not exchange a lot of gifts this year because money is tight. I got a shirt I like though! Yes, Santa was very good to me! I will be staying home this New Year with my husband and daughter. We will have a lobster dinner, then play games and watch a movie. That will be very nice, to go to see Celine in concert with your husband! I did get some surprises like an Air Fryer cant wait to use it. I did not ask for anything in particular but I am satisfied with what I got-mostly clothes. Merry Christmas the day after! I had a wonderful Christmas and got so many thoughtful gifts. I had one gift fail for my daughter which was supposed to be a kitchen grill that turned out to look like a huge toaster. Oops! My fiance got me a Magic Bullet Blender for Christmas!! I'm so excited to use it!! I did get everything I wanted with a few surprises too! I usually know what I am getting for Christmas but this year was a total surprise. I loved everything other than the fact that I didnt get any Starbucks. :( Luckily, I live 10mins away from Starbucks and today I went and got my mocha fix, lol As for New Years, no major plans. We usually sit and home and bring in the New Year. Had a lovely Christmas filled with family,food and friends. We are very low key during the holidays. We do not give prizes or receive them. We just enjoy great meals together! I got a fun surprise- I got engaged! My daughter and I like to treat ourselves when we are out shopping to Starbucks. I plan to stay home and watch the ball drop for New Years. Our holidays are pretty low key. Sometimes we are able to all get together and others we are not. This Christmas my mom has been in the hospital due to difficulties after her heart surgery. Not a good Christmas this year. Its been very hard for everyone. But I am thankful we are all still here and hopefully a better year on 2017. I enjoy being with my family during holidays and any time. I attended church services on Christmas Day and I will attend services on New Years Day. I am very happy with my Christmas, I got what I wanted and my mom came to spend Christmas through New years with us. My 2 yr grandson was in the hospital for a week with pneumonia. He was released on Christmqs Eve. That was the best present,. Had to work on Christmas Eve, Christmas Day, and I'll be working New Year's Eve, and New Year's Day too. But it was a nice (but exhausting) holiday anyway. My husband and kids got me some lovely gifts. Yes, I received a salt lamp and a oil diffuser. This looks like some great things. Happy Holidays !!!! I got a cotton candy machine and I am thrilled. Can't wait to use it. I really enjoy eating cotton candy! Had a wonderful Christmas, with all my children and families home! I enjoyed watching my nieces and nephew open their gifts when they visited on Christmas. I had a great holiday! Everyone is healthy and we were able to spend time together. I could not ask for anything more. No big plans for New Years. I'm sure I'll watch TV and take down the tree as usual. :-) Christmas was great. Scored some great deals with gift cards! We had a very nice Christmas! I had a very nice Christmas and got some nice gifts from my family. The food was so good! I had an enjoyable Christmas, looking forward to the new year. I had a great Christmas with my family and I'm looking forward to having a few days off work to play with my kids and all of their new toys and games! Our Christmas was wonderful-everything we hoped for! We don't usually do New Year's Eve-too crazy! I got to spend time with my family and that was a great gift. No New Year's Plans. Just staying home. My kids got what they wanted, which makes me happy. For New Years we are running a 5K that starts at 11:45 at night and runs through to the following year. Its a family tradition we have participated in for the past 6 years! We had a great Christmas with our family. Happy New Year to all! I had a great Christmas and am looking forward to 2017. Got to spend lots of time with my sweetie. Best ever. We had a wonderful Christmas. We only exchanged gifts with the kids and just a few items. Nothing extravagent. The focus this year was "stress-free time together". It was one of my favorite Christmases. I can't wait for New Years. We are going to a party at my inlaws home. I did get what I wanted this year! There were no surprises, but I had a fantastic holiday. My children were home from college and we spent the week playing games. My granddaughters would like this to make cookies with. I got what I asked for this year. I plan on making lentil soup. There wasn't really anything that I wanted... what I want more than anything else is out of everybody's budget, and the little things I can buy, or at least save up for... But my dad got me this really sweet necklace that basically said that he would love his daughter forever. I thought it was really nice, even though it isn't expensive or anything (I'm assuming). I got what I wanted and I got a surprize. I got what I wanted - my son was home from college! I got exactly what I wanted! A new laptop, slippers and chocolates! I got exactly what I wanted! Face-time with my grand-kids! Yeah I got some great stuff this year. This New Year's we are celebrating with some family. I got a weekend away before Christmas which is what I wanted. We always stay home new years eve and make a nice dinner this year we are having bacon wrapped scallops. I got what I wanted. Gift cards! New Years is gonna be great! My kids and I are heading to his best friend's house because his best friends mom is throwing a party for the kids and the adults! I love it! I got to spend time with my family, which is the only thing I wanted. We had a wonderful Christmas- great gifts and time with the family- perfect! I got everything I wanted and a few surprises. oooooo! an InstantPot! Lucky duck! The easiest thing to try first is either a roast or soup. IMy wife always please me with her gifts. I don't know what my p;ans are for the new year. i received what i wanted this year and a few surprises! it was wonderful. i was also able to gift the things i wanted to! I got all of my kids together and a roof over our heads. That's all I can ask for! I received a slow cooker which I have been wanting for so long. A extra few days off spent with my family made for a lovely Christmas too. Thanks so much for your generosity and kindness!! It's so sweet of your husband to get you guys tickets to see someone you've been wanting to see for a long time! I bet Celine Dion's show will be awesome! Plus just being in Vegas will be amazing!! I went for a wedding when I was pretty young, like 6 or 7 and I still to this day remember it as one of the most fun trips I've been on! And slow cookers, pressure cookers, crock pots, whatever one, they are all AMAZING! It'll be your new best friend! My number one suggestion is whatever you make, a stew, pasta dish, goulash, etc those kinda things, add one of those small bottles of red wine (Sutter home is a good one cuz they come in the perfect size tiny bottles) because that just adds the most AMAZING flavor to any dish, I swear! Lol. Enjoy your trip and slow cooker! It was a pleasant holiday for me. My wish list was small so I got or can get what I wanted. Only wish I could have given a little more on a small level. Like baking cookies and giving them out....or offering small items to those that are in need. I did what I could. My kids were with me and we had the Christmas Eve dinner which is a tradition. On New Years, I just try and keep the cats calm. They hate fireworks. I was hoping I'd get a Bona hardwood floor cleaner but I do have a birthday coming up in a couple weeks. Happy New Year! No new year plans - just having a quiet simple celebration. Yes, I got what I wanted. We plan to go out to dinner for New Years Eve. Happy New Year! We spent ours at home with our 2 boys. No surprises this year, but hope to stick with my plan to get healthy this new year! I got more than I wanted, and family time plans. I had a very generous Christmas. New Year was pretty low key, we had just finished a house project and were exhausted but happy with the results. Happy New Year! didnt get what i wanted this year..maybe next year.. I got what I wanted most which was a nice new vacuum! Happy New Year! The new year is here, and I hope to get healthier and go through my closet. I don't really make resolutions just look forward to progress in the new year. Didn't get what I wanted but that's OK! Happy new year! We had quiet holidays all around. I got some great gifts! I also had a little party with my niece and nephews for New Years Eve! I think my kids got everything they wanted. I did get some fun surprises. I got a all in one printer and some games! I did get what I wanted and a few little extras too! My family and I didn't give each other presents, we just take the time to spend it with each other! My husband has always gotten me something special for Christmas. This year he gave me a gold chain to replace the broken one that holds a diamond heart he gave me on our wedding day 41 years ago. I got a amazon gift card. No I didn't get what I wanted this year. But that's ok. There is always next year. Haha, a surprise that I was pregnant. Was on the pill even. She was a great surprise, tho! It actually wasn't the best New Years. My son came down with the stomach flu. Luckily it only lasted about 15 hours. We had a nice Christmas though. We're hoping to move out of state this year, which is huge for us. Big changes, for sure. New state, new climate, new (to us) house. Scary! I had a pretty quiet holiday season. Yes, I did I received my grant money for school. No surprises here and I brought the New Year in sleeping! I got everything I wanted, now New Year plans. we went to an early dinner on new years and stayed home! I had a great christmas and new years. I told Santa (haha) that I really wanted a trip to this local spa by my house and that's exactly what I got. We had a blessed and an amazing Christmas! This New Years, I stayed home and had friends come over! I got what I wanted!! So thankful! Being with my love ones and seeing them hapoyo and healthy is a blessing celebrating the birth of Jesus I with my family is the best Is the best gift that I want each year and thankful to received. Than,s for the wonderful ️chance. I did get what I wanted. A new desktop. I got some of what I wanted. Wish I could have spent Christmas Day with my two sons. They were at thier wives' families get-togethers on Christmas Day. It was just my husband and I. I did get to spend some a little time with them a couple of days after Christmas. I had a very nice Christmas and New Year. We had a great time over the holidays. I hope you did too! I got happy kids for Christmas which is all I really wanted. What a great giveaway! I had an excellent Christmas and New Year. I am happy with what I got for Christmas and I had a nice New Year. We had a wonderful time with friends and family, I hope you did as well. I had a wonderful Christmas spending some relaxing quality time with family! I really wanted a vacuum and i got one :) Plus a fansy cookware set and some PJ's No coffee though! I got a fun surprise! I started bowling this year and been using a friends ball and they surprised me with my own! Hope you had a joyful, and relaxing Christmas and New Years. I don't get Christmas presents as my grown children cannot afford them and my husband has passed on. All I've wanted for the past 4 years is a vacation to somewhere warm. Someday! My husband got my a jewelry cabinet. I love it!